If you are not having a home party and are going out on the town, bar hopping, or to a special event for your bachelorette parties, it is important to think about the bachelorette party transportation. We have listed some ideas below and helpful tips if you are renting a bachelorette party limo or bachelorette party bus for your Last Night Out festivities. Sober Driver: If you are going to have a sober driver or multiple drivers, make sure to plan this in advance since you need to have the bachelorettes taking the sober party oath be responsible and stick to it. Ask the bride-to-be who would be the most willing (or who does not drink). Send out an email or call these bachelorettes early so they can prepare for the night's festivities and know the game plan. It is also important to make sure their gas is paid for by the other girls so collect this early. Also make sure to bring bachelorette disposable bags just in case there is an unfortunate sick bachelorette on the way home as you don't want a driver to have to get their car steam cleaned due to a bachelorette party accident. Ask around to friends who they use for limousines or a party bus company as "word of mouth" is important in finding a reputable limo company for your bachelorette parties. If you don't have a referral, ask the bachelorette limo company for a referral and visit their site for more information. Make sure to ask the bachelorette limo company on how much the day/evening partying will be. There is usually a package rate for a certain amount of hours plus gratuity (tip). Make sure the bachelorette party divas understand how much the limousine is up front so someone in charge can collect the money early and not be a diva debt collector after the Last Night Out. Many bachelorette limo companies will have you have to place a credit card down as well as a security deposit so make sure to have a responsible point person who will also ask up front for everyone's money who is chipping in. It is customary for everyone to cover the bride-to-be's transportation cost. Also find out about how much additional hours may run. Many bachelorette parties run later than expected and are charged additional rates. Make sure to find out what types of bachelorette party limos or bachelorette party busses the company owns. You can get anything from a Cadillac or Hummer limousine to a large classic stretch limo. Find out what the interior looks like as many bachelorette party limo and bus companies have pictures of their interiors. You want it looking nice if you are going to spend a lot of time and some hard earned dollars to get the limo of choice. 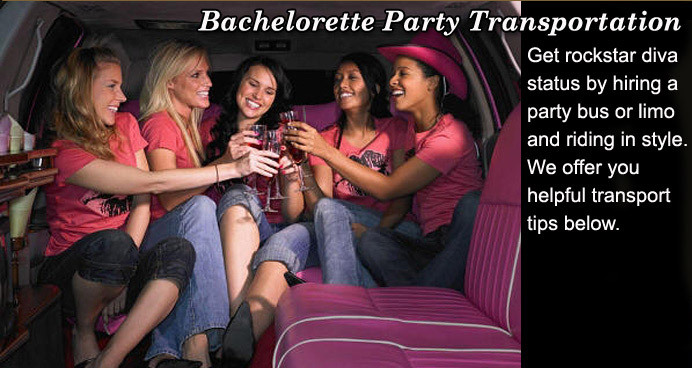 Find out what is included in the bachelorette party limousine package. Some of the common things are a DVD (makes ure to bring some DVD's), stereo, great sound system, lights, munchies, alcohol and other beverages. New ones come with fiber optic lighting, a stripper pole, and even a Jacuzzi for the crazy limos and party busses. Again, find out what is included in the price as well as "wheel and deal" some additional goodies since you have the diva buying power as they need your business? Make sure to ask the bachelorette party limousine company to confirm a few days prior to the party or call them direct. There are bachelorette parties where their specific ordered limousines mysteriously do not show up as it is at another party (that the company got more money). Let the bachelorette party limo or party bus company know that you want a confirmation 2 days prior as well as a guarantee on what you order. In today's age of gas being more than food and a soft economy, ask the bachelorette party limousine company for group/volume discounts. Everyone is looking for work so they will be happy to offer you a deal. If not, find another bachelorette party buss or limo company. Ask the bachelorette party limousine or buss company for which bars, clubs and entertainment companies they have VIP access to, which will make it a better evening as to not stand in any lines and to get free "ins" to the hottest places. Just make sure you research the places the company says they have VIP access to since they may be getting a kick-back from the club, restaurant, or bar which may not be a bachelorette "hot spot". Make sure to plan in advance on your general bachelorette destination(s) and don't have the limousine driver waste your money on driving without knowing where to go. Map out your bachelorette party course of partying in advance so you can have a rough estimate on where you are going and the amount of hours you will need the bachelorette party limo or party bus. It is customary and actually necessary to tip the driver of the limo or party bus. Some companies include gratuity in the amount you pay up front (find this out). Make sure that all the bachelorettes have enough to tip the driver as he/she is taking you and your crazy friends around for the evening and has to deal with diva pampering. Just make sure to be cool with the tip but also tip accordingly to the driver's attitude, help and entertainment pampering. Typically, 15 - 20 percent of the rental price is appropriate. The best bachelorette party limo rides have you and the bride-to-be's favorite munchies and drinks. If you don't bring the food and drink with you, stop off at a near-by store and load up! The limousine company may already have loaded up the bachelorette party limousine which you can ask about when calling and setting up the reservation. Check out the bachelorette party candy you can get which will add to the fun of the evening. It is very fun to decorate the bachelorette party limo or party bus with bachelorette party supplies. Place up streamers, bachelorette party balloons, and some bachelorette party blow up dolls to make the party come to life! If you are celebrating your party in Sin City look for a Las Vegas Bachelorette Party Package that includes limousine for bachelorette parties. Just make sure to have a great time and not to trash the limousine. Party like rock stars without the damage. Remember to not drink and drive which is why a bachelorette party limousine company or party bus agency is our transportation pick for bachelorette parties! Let us know if you have any other transportation suggestions for bachelorette parties and we may post them (bachelorette@bacheloretteparties101.com).